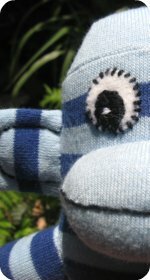 Crazy sock monkey face pictures for you to view. 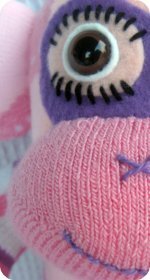 These fun images are of different sock monkey doll toys, also there are pics of sock cows and sock elephants. 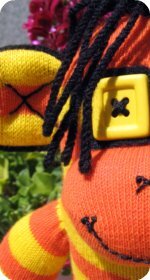 There are so many different ways to do sock toy faces, these are just a few examples to provide a little entertainment and hopefully some inspiration. Some are cute, some sweet looking and some are down right ugly. It's amazing how appealing even some of the ugly ones are. When it comes to creating an traditional looking facial features, you are best to have a looking in one of the pattern books to see what they look like as the ones featured here are not traditional looking. 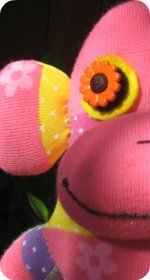 For more details on a particular monkey, just click on it's photo and you will shot off to it's "monkey profile" where you will find larger photos and detailed information on how to construct each individual doll. TIP: If you intend for a sock monkey doll or any other sock toy to be given to a small child, its very important to make sure it's child friendly. 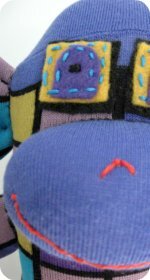 Embroidering the eyes is one way to make it safer. Kids are magic when it comes to pulling things apart and pulling things off like toys eyes. 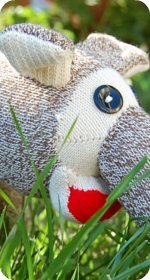 Free patterns for sock toys are available to help you get started. Pattern books can also be purchased which are full of ideas and of course many, many patterns. The pattern books are full of tips and show wonderful techniques on how to do things like hair, faces, clothing.